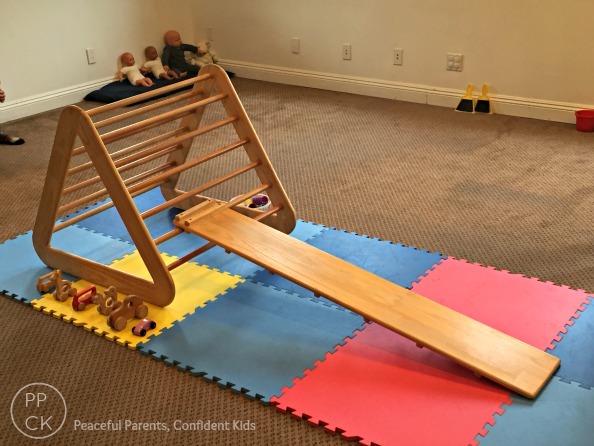 A new baby crawls towards a low platform for the first time and she asks the parents to stay quiet a minute so the baby can concentrate on this new piece of equipment without being distracted. It was just so thoughtful and something that would never have crossed my mind to do previously. The baby rights herself and puts her on hand on the platform, banging it and vocalising almost as in agreeance with all Deborah had said. When an older baby who is more familiar with the platform, also rolls off it, Deborah says nothing. She is sitting right by her. She just gives her a look that said “I notice you rolled off.” The baby lies on her back on the ground and seems not to be bothered by her tumble. She carries on playing with her hands and acting like that was exactly how she meant to dismount from the apparatus. It made me realise that there is no one size fits all when it comes to what to say in certain situations with children. It is about knowing the child, knowing the full picture and responding sensitively to each and every baby’s individual needs. Perhaps, now, if the first baby returns to that platform and tumbles again, Deborah’s response would be different. She might say less and observe more before moving in. Either way, Deborah’s class had an air of peace and tranquility about it. Even though there were babies vocalising, some crying for different reasons and some just loving making noise, the respectful interactions we witnessed today made us all agree it was like a type of meditation to observe. It was certainly good for the soul and I was moved to tears at some points. One of the things that made the environment so calm, peaceful and optimal for a baby’s play was its thoughtful set up. Thinking about the development of a child and creating a safe, cognitively challenging environment for them is one of Magda Gerber’s basic RIE principles. But within that challenging environment, a child must be able to feel competent and not overwhelmed. Thinking about the way a child can grip and then placing objects that are easy for him to grasp so he can explore them fully is important for example. For a younger baby, softer objects allow for that easy grasping and also takes into account their movements which are not always very controlled and often jerky. Thinking about the hardness of an object will ensure they won’t get hurt if they hit themselves or others. Toddlers love to sort and collect, so buckets and containers with smaller objects that can be placed inside, dumped and transported are ideal inclusions for them. I wanted to show you some of the photos of the room set ups we did today. They were so brilliant in their simplicity and I felt there was much to be learned by seeing what was used and hearing the reasons behind each of the chosen objects and their placements. 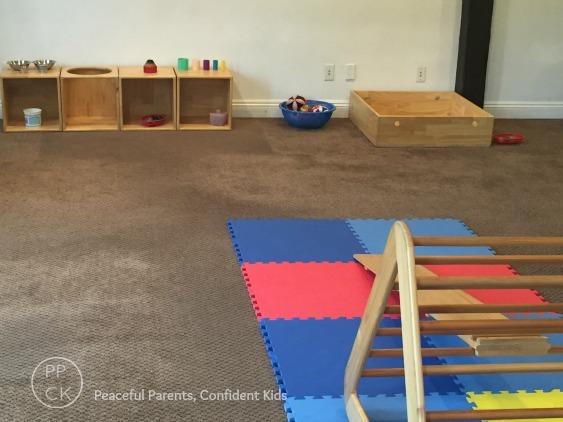 This play space was set up for babies who are crawling on all fours (approx 8-12 months). 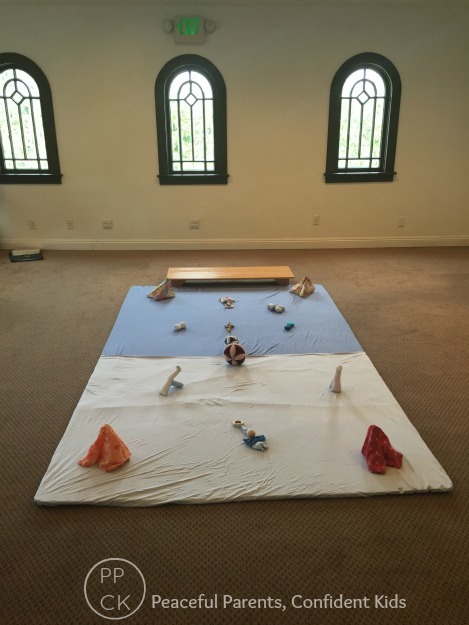 There are a variety of play objects placed around the mat offering various different shapes, sizes and textures. The napkins displayed in a tent-like peak invite babies to grasp them easily even if they have not yet mastered the pincer grip. The small platform at the end of the mat offers the adventurous baby somewhere to work on gross motor development and balance. Today we saw a couple of the babies tumble from this platform as they navigated their way on and off, but being only 10cm from the ground, they were safe and happy to persevere in their mastery of it. The wooden cubes against the wall gave the crawling babies somewhere to go when they were confident to move away from their parents. A single, everyday item was placed inside each cube, inviting the babies to investigate. The red basket was a favourite and it was satisfying to watch the babies manipulate this object in many different ways, noting its texture, shape and sound-making properties. 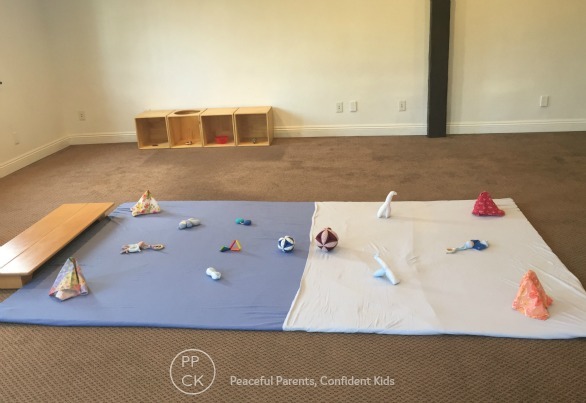 This room was set up for toddlers who are competently walking, aged from about 18 months to 2 years. Notice the equipment used to explore climbing is much more challenging. I also liked the little cars purposely left nearby for the child that might decide to roll them down the ramp. In the back corner, dolls were set out on a little pillow, inviting a child to enter a world of role play, Often at this age, role playing with dolls helps them make sense of things that are happening to them and that they see happening to others. 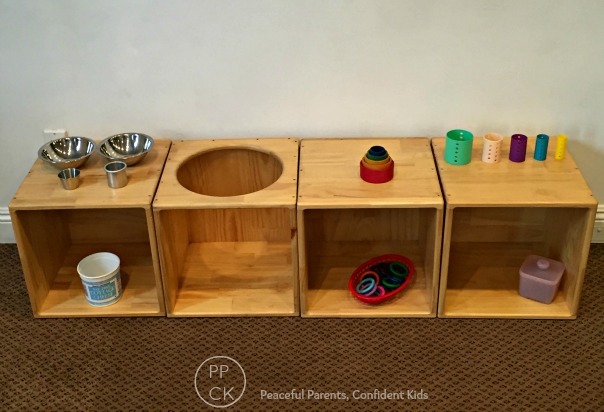 There is plenty of space for movement and the play objects selected are simple and passive. Magda Gerber always stated that passive toys make for active babies and active toys make for passive babies. Simple, open-ended toys that do not have a singular purpose, brings out the scientist in children who are then free to explore, create, design, experiment, discover, learn and grow. In the toddler set up, there are more manipulatives for them to explore. Buckets and containers to put things in and sort and dump. The objects have different textural features such as wood, metal and plastic which the children can explore. Notice how things are orderly and have been arranged with care and purpose. This helps children to see that the play objects have been respected and that the adults care and place value on their play. It also allows children to easily sight objects. When they are always placed out in that way, they become familiar, comfortable and competent with the objects and the equipment. I love this large upturned platform paired with a couple of baskets of things children can use to toss into it. I can just imagine the children filling up the box and then climbing in with their collection. 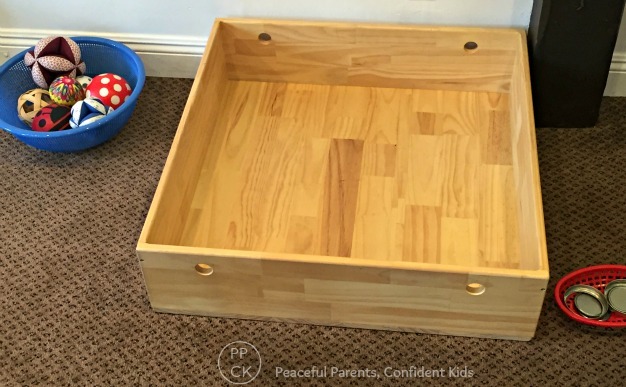 This box could also become a boat, a car or just a cosy space for a child to hang out. It was lots of fun observing the classes today and I was slightly lamenting the fact that there is an entire Pacific Ocean between where I live and here. I would love to have something like these classes in my area. The importance of the play space became so apparent today as we witnessed children getting about their business of play and being completely respected as they did. Yes, why does that ocean have to be so biiiig?? 😉 Thanks for the posts, Kate. I’m loving following you and reading your snippets of insight. My pleasure Natalie! One day we will make RIE the norm in Oz! Love this. Thank you. We have an 18mth old (raised RIE since birth) and a 4 day old… I’m starting to think about how to do two separate play spaces. I have the rails to divide the play area but I’m concerned about the older one throwing things into the younger ones space. Our 18mth old has wooden items and wooden cars and books… Do I remove them temporarily? Lovely to read about your trip to the US! Any chance of you setting up a RIE playgroup here? 🙂 You’d have at least 1 faithful attendee! Hi Joanna, thank you for following my journey. Yes, I hope to set up some parent-infant classes inspired by what I have learned in the near future. I am not a RIE associate so I won’t be calling them RIE classes but they will definitely be based on that approach! I’d love to have you there!